This November, California residents will vote on a new law regarding the legalization of recreational marijuana use in the state. Currently, California has a partially-decriminalized set of laws regarding marijuana use (such as simple infractions for small amounts of possession and the ability to be prescribed marijuana from a doctor), however, the criminal justice system is still overwhelmed and bogged by numerous misdemeanor and felony cases surrounding drug use. Prop 64 is designed to be a sweeping overhaul of the current laws through large-scale reduction and elimination of criminal penalties. Under Prop 64, the laws most affected are those surrounding possession, transportation, and cultivation of marijuana. If Prop 64 passes, the laws will go into effect immediately on November 9, 2016. How will criminal penalties by reduced or eliminated if Prop 64 passes? Prop 64 seeks to legalize the personal possession of small amounts of marijuana by persons aged 21 and over. As a result the following laws, in addition to others, will receive comprehensive revision: Health and Safety Code sections 11357, 11358, 11359, & 11360. Penalties under these sections will be applied depending on the age of the defendant: (1) 21 and over, (2) 18 to 20, or (3) juveniles under 18 years. While Prop 64 will legalize simple possession of marijuana and cultivation of up to six plants, other acts will remain criminal in nature. However, under Prop 64, certain crimes that are currently felonies will be reduced to misdemeanors. For example, certain sales of marijuana (Health & Safety Code 11360) and possession with the intention to sell (Health and Safety Code 11359) will become misdemeanors in most instances. Prop 64 will reform and provide a general overall reduction in penalties for adults 18 to 20 years old. For the most part, most crimes will be reduced to simple infractions, rather than felonies or misdemeanors. While some activities may be legal for all adults 21 and over, adults between 18 and 20 will be subject to fines. For instance, under Prop 64 cultivation of up to 6 marijuana plants will be legal for adults 21 and older, but for adults 18 to 20 years old, they will be subjected to a maximum $100 fine. One of the most damaging effects of the current laws surrounding marijuana is their impact on juveniles. Prop 64 seeks to correct these damages while still ensuring a safe prohibition on juvenile use of marijuana. Under Prop 64, most marijuana offenses committed by juveniles will only result in fine-based infractions, eliminating misdemeanor and felony punishments that have long-lasting negative effects when they become adults. Furthermore, Prop 64 will eliminate threats of imprisonment, and in some instances fines, by requiring drug awareness education, counseling, and/or community service. Will Prop 64 be Retroactive for Previous Arrests and/or Convictions? Yes. The reduced, or eliminated, penalties under Prop 64 will have a retroactive effect for convictions under Health and Safety Code sections 11357-11360. As a result, if Prop 64 passes, defendants are able to petition the court to reduce or remove their previous convictions. If Prop 64 Passes, do I Need an Attorney to Petition for Reduction? This all depends on the circumstances surrounding your case. In most cases, people with prior convictions of possession do not have additional criminal convictions and may not require the assistance of an attorney. However, for many others who have prior drug-related convictions and/or any other misdemeanor or felony convictions, it advisable to consult with an attorney to evaluate your odds of successful petition. 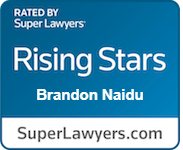 Attorney Brandon S. Naidu has considerable experience in petitions for reduction, early termination of probation, and expungement and is fully prepared to assist his clients with their Prop 64 petition needs, should the law pass in November.